New Delhi, July 13: Vishwa Hindu Parishad (VHP) today said that the establishment of Sharia Courts in all the districts of the country will be detrimental not only for the Muslim women but the entire nation. This will also end up in creating a sense of disrespect towards the Indian judiciary among the Muslim masses. VHP Joint General Secretary, Dr Surendra Jain said that establishment of a parallel judiciary in the form of sharia courts was nothing short of a conspiracy. He also termed it ironical that a certain body called All India Muslim Personal Law Board, which is totally illegal and unconstitutional, is going to establish illegal Sharia Courts. Dr Jain added that it is the right time to disband this fundamentalist organisation, which is bent on keeping the Muslim masses backward. Dr Jain said that the Mulla-Maulvis, through the medium of Sharia courts, will nullify the Supreme Court’s decision on Triple Talaq. The case of Nikah Halala and polygamy is also pending in the Supreme Court. No civilised society can support these practices. This is a conspiracy of the Muslim Personal Law Board to nullify the upcoming rulings on these subjects. 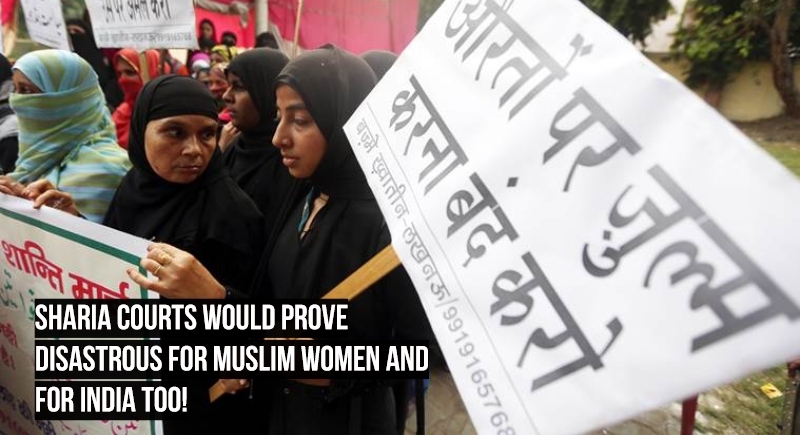 The VHP believes that such Sharia Courts will become a handy tool to protect Jihadists right to suppress Muslim women and spread hate in the country. The VHP also believes that these Sharia courts will be disastrous for the non-muslims in muslim majority areas and they will be forced to accept its Talibani rulings. These courts will legalise the marriages of minor Hindu girls after religious conversions, like it happened in the case of Anita in Bengal. These courts will legitimise the atrocities committed by the jihadists on Hindu women. Hindus will be victimised if they protest against such courts. Nigeria and Sudan have witnessed the violence wrought on the society because of sharia courts. Dr Jain asked if the Muslim Personal Law Board is trying to transform India also into a violent society? Dr Jain said that the Muslim Personal Law Board is trying to conceal its wrong doings by establishing these courts. After all, how many Muslim women would be able to summon courage to challenge the decision of these sharia courts? Dr Jain added that it was unfortunate that the Congress and Communists, who had opposed the Khap panchayats, are siding with the sharia courts. The Mulla-maulvis has already been issuing anti-women and anti-humanity fatwas even without the sharia courts. They will misuse their unlawful powers enshrined by these illegal bodies.